An excellent sale of 1203 sheep on Tuesday with lambs selling to a top price of £95.20 and a top of £4.16 per kg. Fat ewes sold to a top price of £106 and rams to a top of £120. 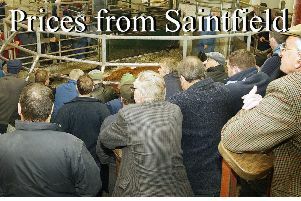 LAMBS: Downpatrick producer, 27 26kgs £95.20, Comber producer, 3 27.5kgs £95, Downpatrick producer, 24 26kgs £94.80, Crossgar producer, 2 27kgs £94.50, Downpatrick producer, 30 25.75kgs £94.20, Killyleagh producer, 21 24kgs £94, Killinchy producer, 22 25.75kgs £94, Ballynahinch producer, 15 26kgs £94, Seaforde producer, 50 24.5kgs £93.50, Ballynahinch producer, 10 25kgs £93, Bangor producer, 4 25kgs £93, Lisburn producer, 2 25kgs £92, 3 25kgs £91, Ballywalter producer, 12 24kgs £92, Greyabbey producer, 31 23.5kgs £91, Saintfield producer, 25kgs 90, Groomsport producer, 8 21.5kgs £89.50, Killinchy producer, 14 23.75kgs 89, 9 21.5kgs 83.20, Killinchy producer, 20 23kgs £88.50, 12 22.5kgs £83, Dromara producer, 4 22.5kgs £88.50, Lisburn producer, 24 23kgs £87.50, Dromore producer, 9 23.5kgs £87, Castlewellan producer, 17 23kgs £87, Castlewellan producer, 21 23kgs £86.50, Hillsborough producer, 5 22kgs £85.50, Comber producer, 10 23kgs £85.50, Saintfield producer, 18 22.75kgs £85, Ballynahinch producer, 18 22kgs £85, Downpatrick producer, 15 22kgs £84.80, Dromara producer, 12 22.5kgs £84.50, Ballynahinch producer, 19 22kgs £84.50, Ballynahinch producer, 18 22kgs £83.80, Crossgar producer, 5 22.5kgs £83.50, Carryduff producer, 51 22.5kgs £83.50. Kircubbin producer, 3 21.5kgs £83, Dromore producer, 4 22.5kgs £83, Lisburn producer, 8 22kgs £83, Ballyhalbert producer, Ballyhalbert producer, 8 22.5kgs £82, Carryduff producer, 8 21.75kgs £81.80, Ballynahinch producer, 17 22kgs £81.50, Crossgar producer, 8 21.75kgs £81.50, Saintfield producer, 21 22kgs £81.50. FAT EWES: Kircubbin producer, £106, Killinchy producer, £91, Dromara producer, £90, £74, Portaferry producer, £87, Lisburn producer, £86, Ballyhalbert producer, £84, £74, Castlewellan producer. £85, Downpatrick producer, £85, Belfast producer, £80, £70, Toye producer, £79.50, Comber producer, £79, £70, Portaferry producer, £76, Crossgar producer, £75..
RAMS: Moneyreagh producer, £120, £72, Portafery producer, £88, Bangor producer, £88.